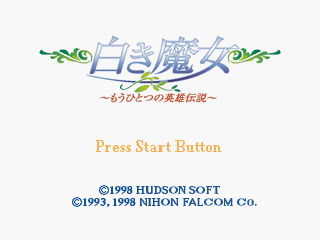 Shiroki Majo: Mouhitotsu no Eiyuu Densetsu (白き魔女 ～もうひとつの英雄伝説～) is an RPG by Falcom ported to the Sega Saturn in Japan by Hudson in 1998. It is the third entry in Falcom's The Legend of Heroes/Eiyuu Densetsu series, and the first entry in that series not to be part of the Dragon Slayer series. Special Thanks: Keigo Yasuda, Koji Arai, Takashi Sawaguchi, Hiromi Okamoto, Tadashi Ozaki, Osamu Kimura, Shuichiro Nishiya, Noriko Tsuruoka, Kenji Fukuya, Falcom, Shinji Yamazaki, Tadashi Hayakawa, Rayforce Inc.
Main article: Shiroki Majo: Mouhitotsu no Eiyuu Densetsu/Magazine articles.